My favorite part of Sawyer’s Pirate birthday party last March were his Tic Toc Croc Pirate Crocodile Cupcakes that were a last minute thought that came together effortlessly. In the past, I’ve made some pretty elaborate cakes like my Mickey Mouse birthday cake, but this year I had spent some time on other projects, and it became the night before the party, and I still had nothing. I had seen a cute cupcake display on Pinterest but every photo I could find landed me on a dead link, so I had to wing it. 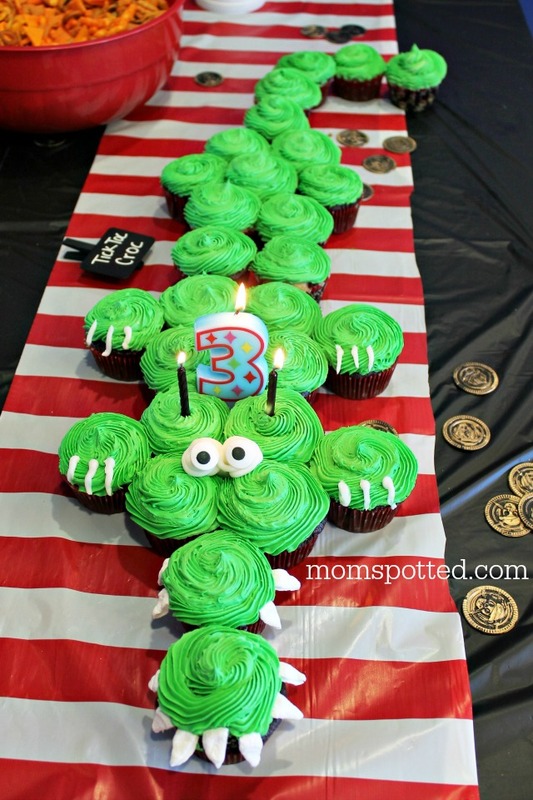 Since his party, it’s asked about more than a handful of times, and so I’m here sharing my version of our Tic Toc Croc Pirate Crocodile Cupcakes. To line them up I played around with them at home before heading out. Once I had it exactly how I wanted it, I took this photo on my phone for a quick reference at the party. 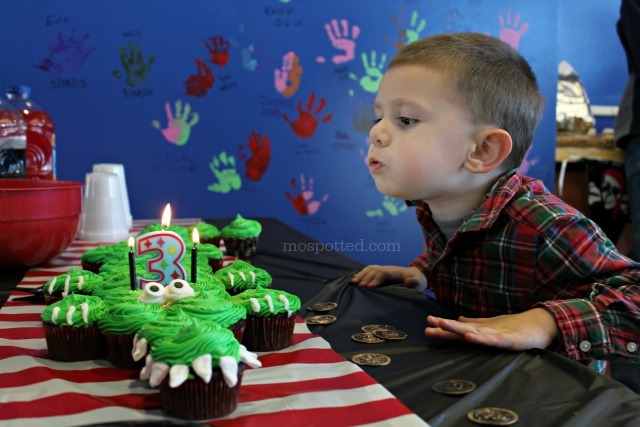 The cupcakes needed to be lined-up exactly like this at the children’s museum later. 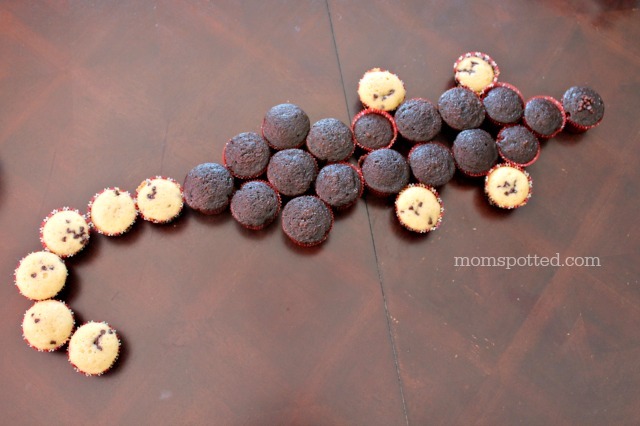 You will need a total of 28 cupcakes to make this. Now my party frosting trick is that I cheat and instead of making my own I buy a huge tub of Wilton’s frosting. It tastes excellent, and it saves me time. Plus, buying this big tub is way cheaper than buying 10 of the small ones at the market. You can prep the color ahead of time or just make it there. All you need to make it green is Wilton Green Icing Color and a large angled spatula. It will take a few minutes to mix it in fully. 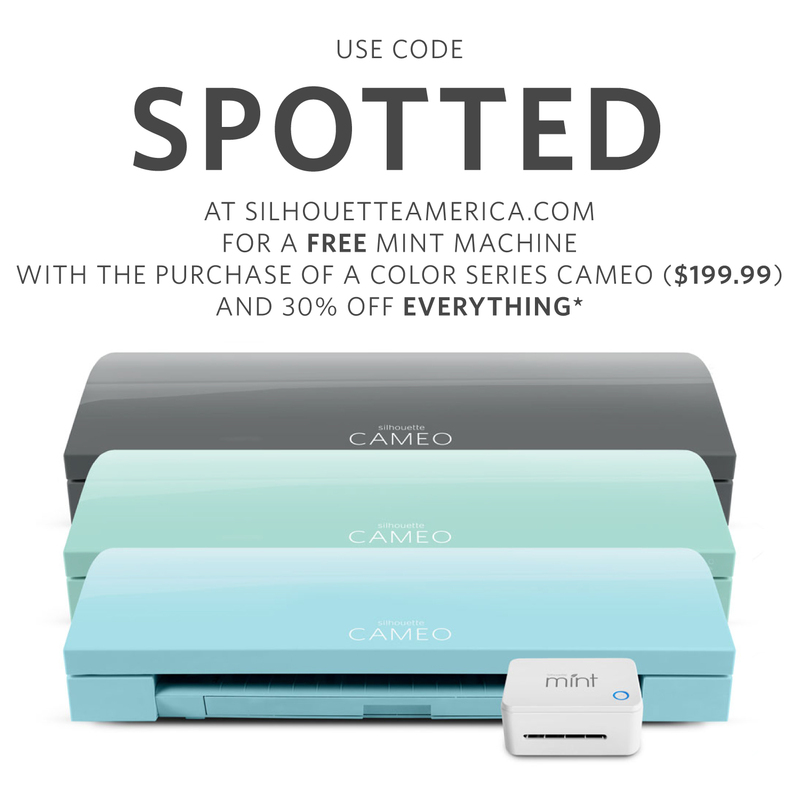 Start with just a small amount of color and then add more as needed. Some colors will become more intense as they rest as well. To give the cupcakes a little texture I decided to go with a large open starred tip. I could have done a better job frosting these, but I waited until the very last moment to do everything and was rushing through. I would recommend starting with the end tailpiece and working your way forward. I couldn’t figure out what to do for the teeth and finally decided I flattened large marshmallows and then cut them into triangles. Make sure you have your pieces cut before frosting your last two cupcakes. If the frosting sits too long, it will be difficult to use it as glue for your “teeth” to bond to the frosting. To make things even easier, I brought along a tube of white frosting (you could easily remember to grab some out of the first frosting tub before coloring) and used it to draw the lines on the feet and to make the big circles for the eyes. Then I added in Wilton large eyeball candies, and it was complete! 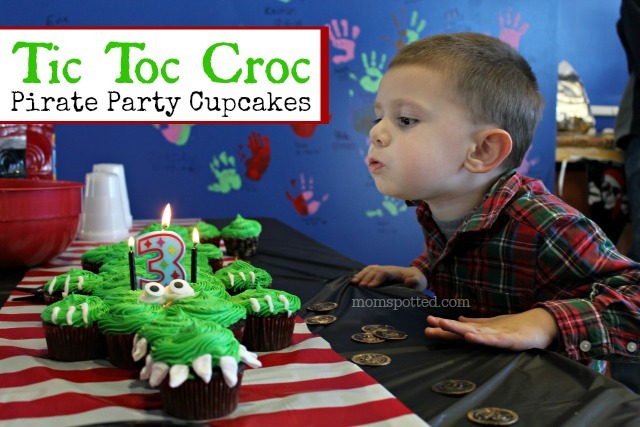 When Sawyer saw his Tic Toc Croc Pirate Crocodile Cupcakes, he was thrilled. He thought it was the coolest thing ever and made sure everyone saw it! It was the perfect finishing touch to the big Pirate Birthday Party I had planned, and while it took me forever to figure out what to do, I couldn’t have been more pleased with the outcome. 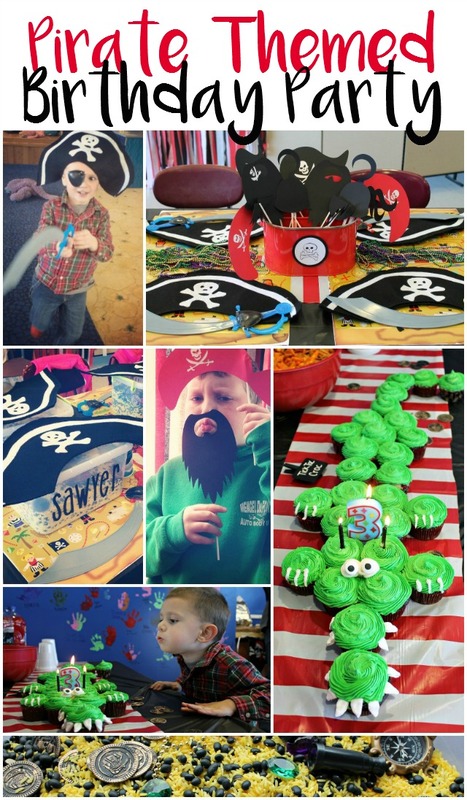 Click the below photo for more on our Pirate Birthday Party. 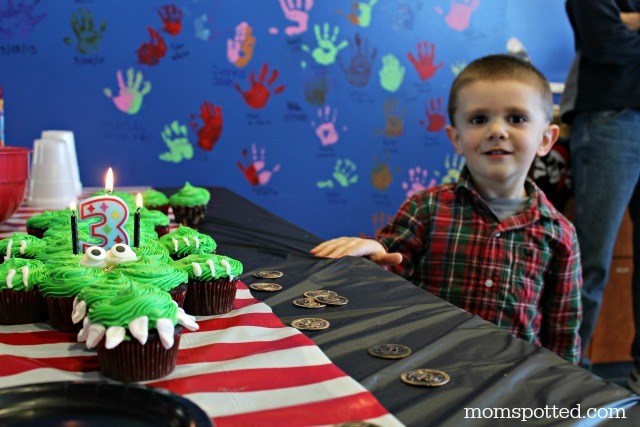 Check out more birthday party ideas on (and make sure to follow!) 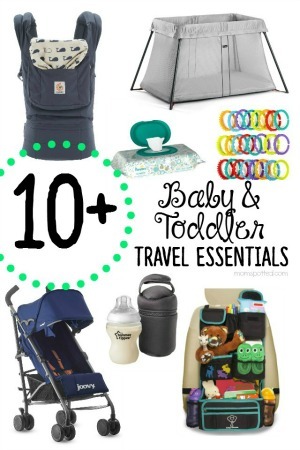 our Pinterest board! 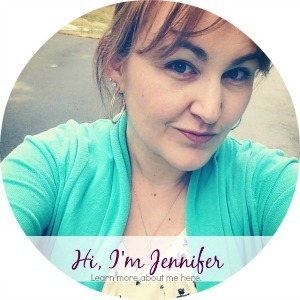 Follow Jennifer MomSpotted’s board Birthday Parties!! on Pinterest. That is adorable! It looks like you had a fun party. This is so cute. I wanted to let you know that I am featuring this in my Birthday Parties Roudup if you don’t mind. This is so cute! It looks easy too! This is adorable, and well done! I also enjoy making cakes too. I showed this to my youngest son, and smiled and said he likes it too. Great blog BTW. I like the ‘cakes’ made out of cupcakes. 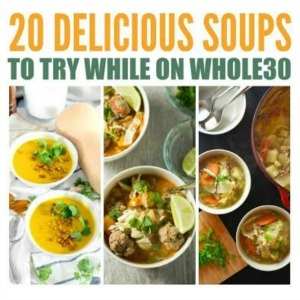 So much variations, easy to eat and easy to make too. You did a great job. I really like cupcakes ‘cakes’. I have always thought they were easier to make and to control. I also like that kids (and adult) can grab and go.